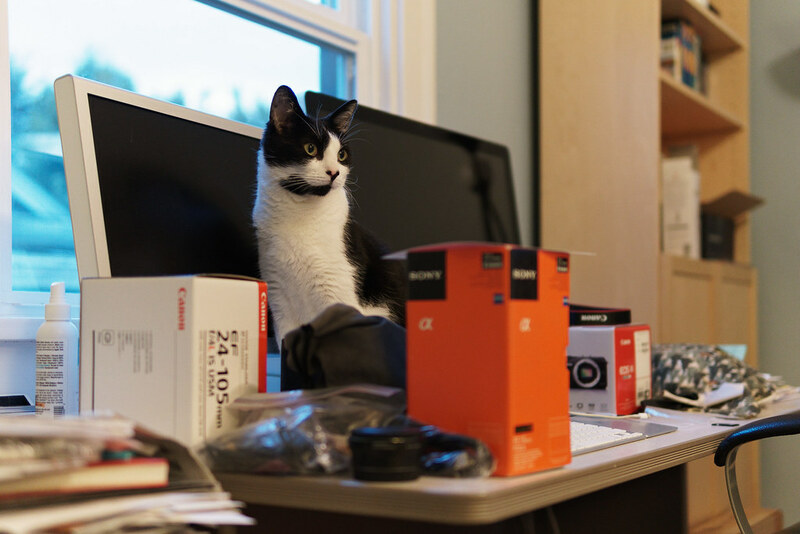 Back in March, shortly after the new Sony camera arrived, I looked up to see Boo standing amidst cameras and lenses stacked on my desk, some rather close to the edge. On the left was an old, well-used and well-loved Canon lens (the original 24-105mm) that I was trading in as part of a special to get the lens on the right, the Sony Zeiss 55mm 1.8 prime. Back behind him was the Canon mirrorless camera that was also being replaced with the Sony. I didn’t open the new lens until I was sure the old one had been received and evaluated, but I drew my breath in at the thought if Trixie jumped up and startled him the new lens might go tumbling before ever being used. Rather than risk startling him myself I did the next logical thing, took his picture with the new camera, and he soon hopped down without incident and I moved the lenses back from the edge. 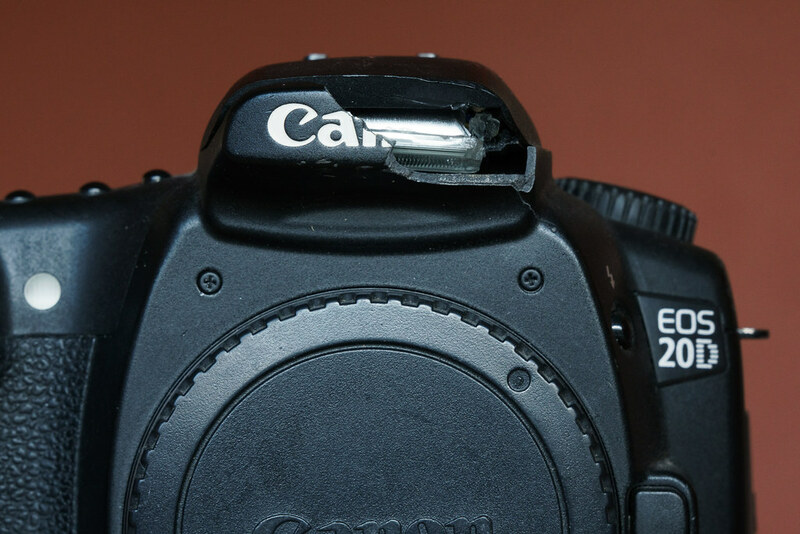 When I was in graduate school in the mid-90’s, I got an unexpected bonus from one of my internships and I bought my first SLR, a Canon Rebel, and got hooked on photography. 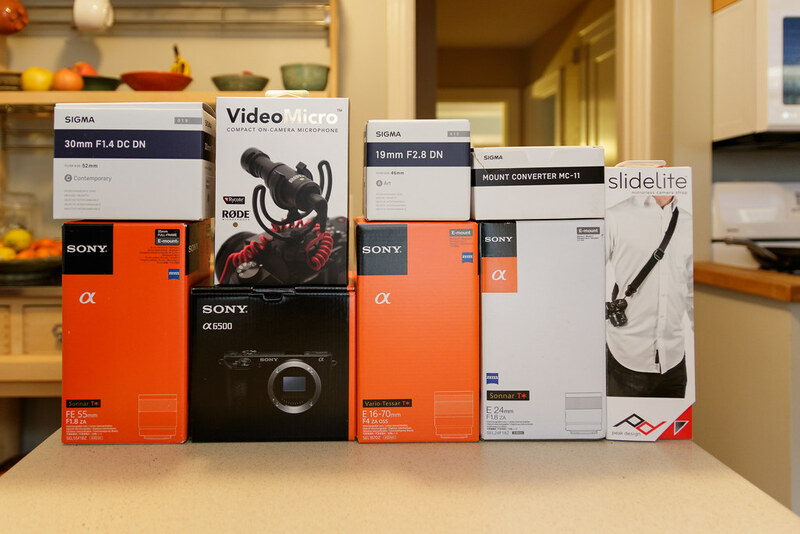 I’ve shot with nothing but Canon ever since until today, as the Sony A6500 mirrorless camera I ordered just arrived, along with a handful of lenses and some other accessories. I’m not saying goodbye to Canon in general, I’m still going to keep my 7D Mark II for wildlife shooting with my telephoto lenses. 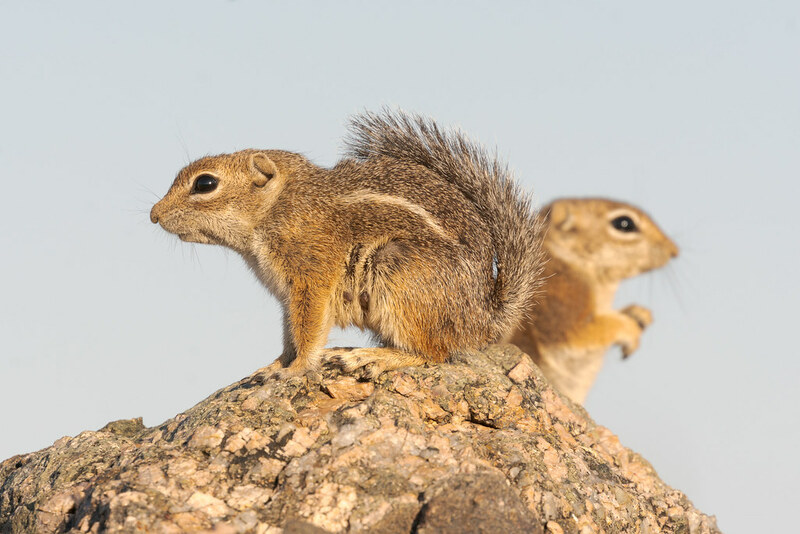 What it is replacing, in addition to many of the 7D’s tasks, is my little EOS M, Canon’s flawed yet charming entry into the mirrorless world a handful of years ago. 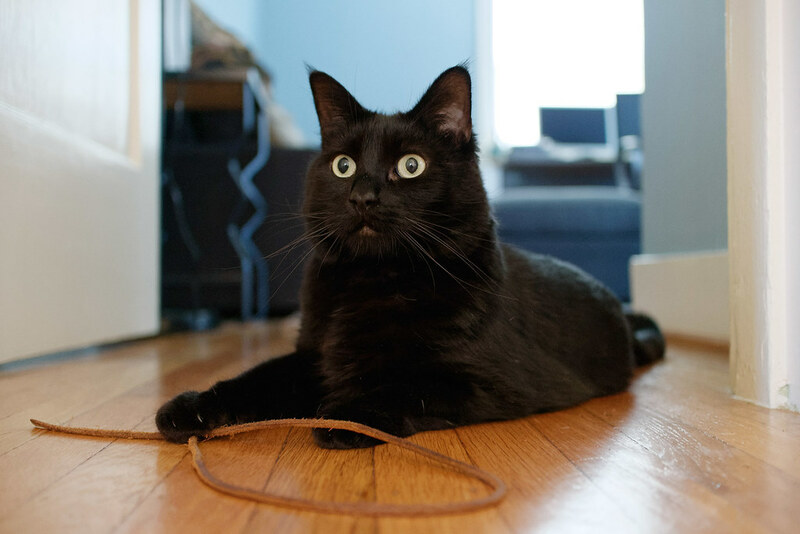 I bought my M four years ago when Canon had a fire sale due to slow sales, we had just adopted Boo and he was so timid I wanted a small, quiet camera to photograph him. I used it quite a bit for the next few years and always loved its quiet nature, useful for example for this picture of Trixie when she had been with us a few weeks. 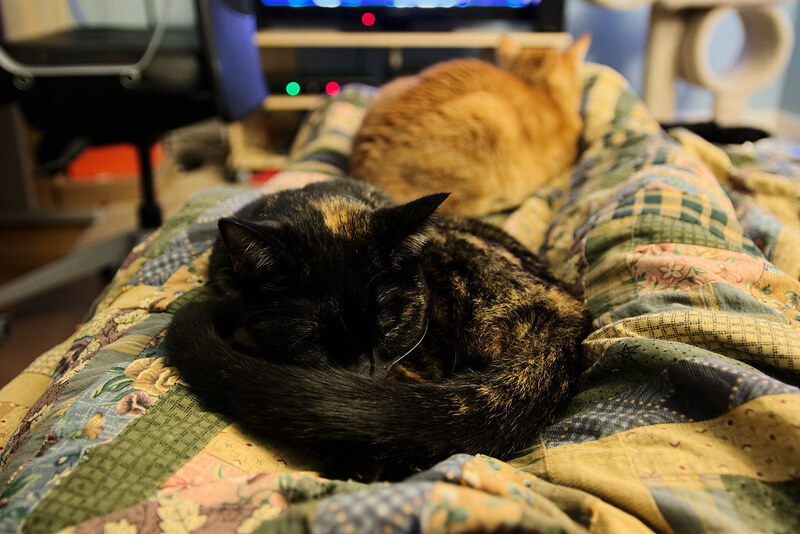 She was starting to feel at home and we were letting her explore ours, but also still giving her time in isolation, partly because she seemed to appreciate the chance to relax without the other cats around, but mostly because brother Boo was still coming to terms with her arrival. 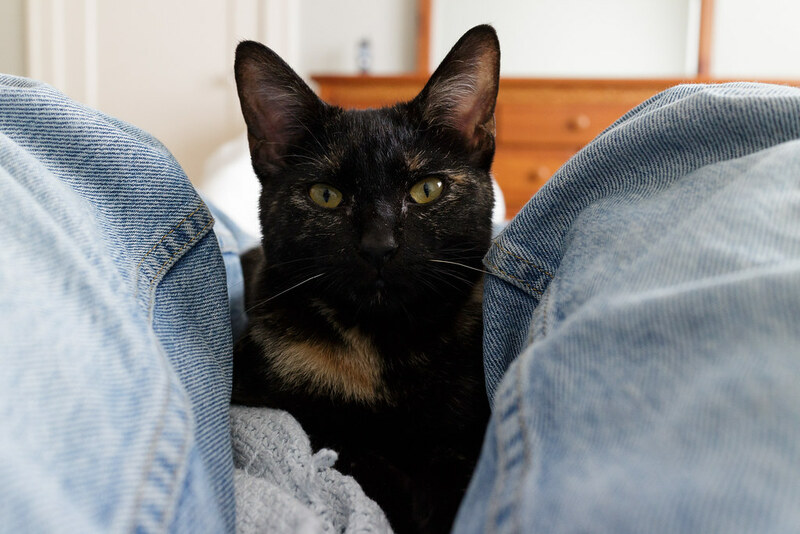 The tiny kitten makes my legs seem enormous, I love that you can put mirrorless cameras wherever you want and use the screen to frame the picture, in this case with my head on the pillow I stretched out my arms to put the camera at her eye level instead of mine. I’ve posted the picture of Emma below before but it seems fitting to repost it now, it’s one of my favorites of her and also taken with the M and the delightful little 22mm pancake lens. For all its limitations it’s staggering how much more capable it was than my first film camera, this was shot at ISO 3200 in low light, in the film days my only hope would have been to fire off a flash and risk disturbing her. I never dreamed she’d only be with us for another year and a half, I’ve thought of this picture so many times since she died that it almost feels like the M was worth it for this picture alone. I haven’t liked what Canon did with the newer M models in the years since, which is why I’ve finally switched after thinking about it for a long time, I’m not sure they ever understood what they got so right (and so wrong) with the original M. As excited as I am by the new Sony, I wanted to take a moment to say thanks for the old, I had a lot of fun with the M and I treasure the many images I took with it. It cost me little but its rewards were great. 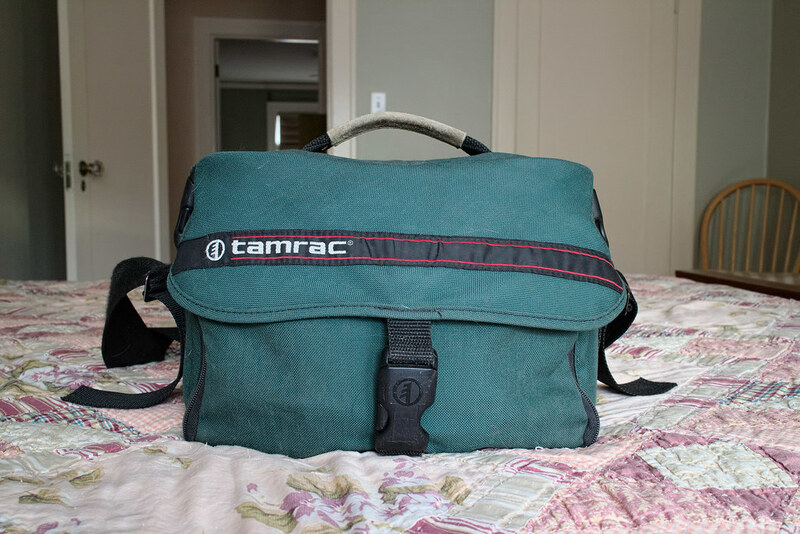 My retirement is sadly still a couple of decades away, but it may be time to retire my Tamrac camera bag. I bought it when I first got into photography in the mid-90’s and for over twenty years it’s been with me on every hike and every trip and stores my gear in the days in between. Built so long ago it was actually made in the United States, I don’t know its model number as there is no branding except the Tamrac logo on the front. Tarmac had just upgraded this model with a clever organizer system that could be moved around to suit the user’s needs, common today but seemed new back then, so I was fortunate to buy when I did. For a little perspective, the bag has been by my side for every single wildlife picture I’ve ever taken (and most of my pet photos). In the past few years I picked up a couple of smaller bags when I’m just taking a single camera and lens while walking Ellie, but I don’t like either of them nearly as much as this one. Thankfully I rarely fly any more, but one of its charms is that it can go in the overhead bin of even the little puddle jumpers, so I was able to take the bag with me when I went to Japan on a business trip and bring along my nicer cameras, I hard lesson I learned after taking only a pocket camera on an earlier trip to China and regretting it later (small cameras back then weren’t very good, unlike some of the marvels available today). Long ago a prong on one of the side buckles broke, but now one in the front has broken as well, and that’s the one that really matters. The other prong still works so the bag still closes, but if it breaks it could spell trouble. There are two buckles on the side, and a zipper underneath the big flap, so there are some extra precautions I can take in the meantime. I’ve thought about getting someone to undo the straps so we can replace the buckles, but I’ve never liked the shoulder strap which is harder to replace. I’ll look around at newer bags but can’t imagine I’ll find something as well made, functional, and lightweight. Between this and my Tom Bihn messenger bag, I’ve had good luck with bags.